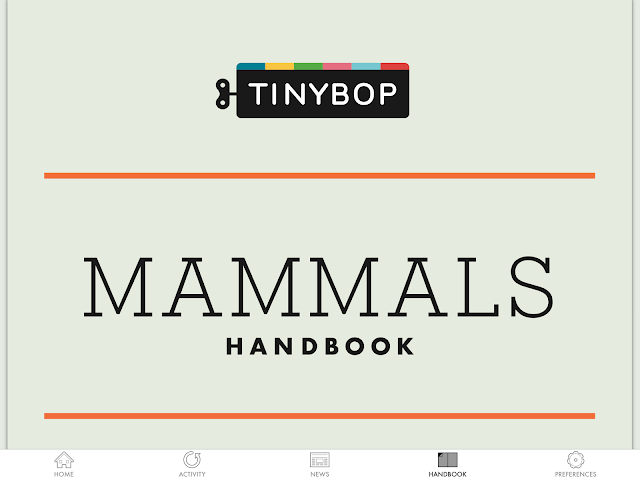 MAMMALS is an app by Tinybop especially made for kids aged 6 - 8. At Tech Age Kids, we don't often review apps, but we really like the Tinybop series of apps with their focus on STEAM topics and playing on the curious nature of kids. Both Tracy and I have used Tinybop apps with our kids since they were very young. I love the design and user experience of the app, it's kid-friendly but not sickeningly kiddie! My two boys - aged 6 and 8 explored the app with me and share our thoughts with you. It's a bonus that a new animal was added to the app this week - SLOTH! These days there are a ton of "educational" apps for kids with varying degrees of "education" and "entertainment". There are also plenty of free choices available. However apps cost money to make, and the good ones are definitely worth paying for. 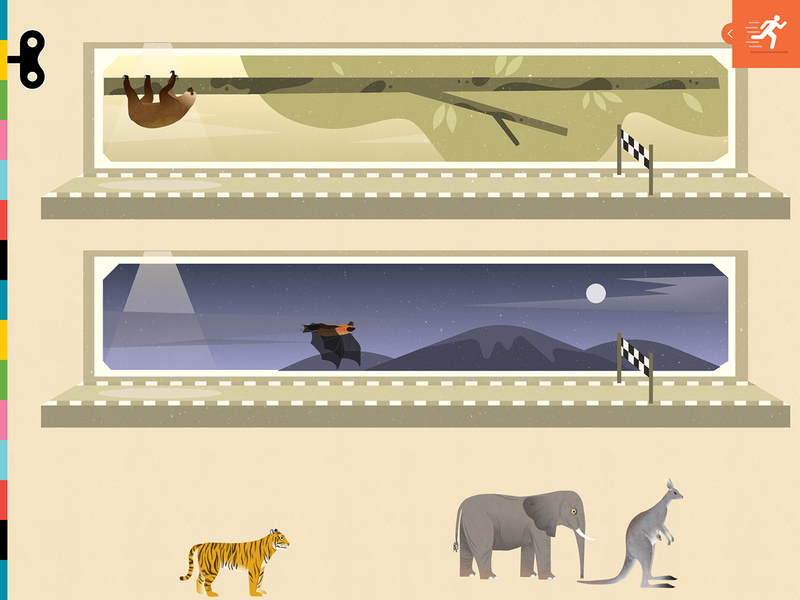 The Mammals app explores the lives of five different animals - elephant, tiger, kangaroo, bat and now sloth! Mammals is No. 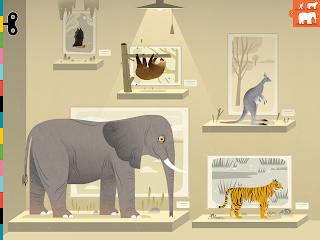 9 in Tinybop's Explorer's Library, series of STEM apps focussed on developing curiosity and learning about the world around us. The Tinybop apps are only available for iOS devices, including iPhone, iPod and iPad with iOS 7.0 or later. We tested the app on our iPad Air. BUY: You can purchase the individual Mammals App ($2.99) or invest in the Explorer's Library ($17.99) which includes Mammals and 8 other apps. The graphics and sounds are REALLY good. I would often ask my kids to turn down the sounds on their apps, as the music gets very annoying. I didn't find this with Mammals. In fact, I would say, turn up the sound to enhance the experience (you can actually "feel" the heartbeat of the animals). The graphics are fantastic and include original artwork by US based illustrator Wenjia Tang. You can even stroke a tiger in this app! Kids will be well informed of the different parts of the animals, both outside and inside. They can explore the muscular, cardiovascular, nervous, digestive and skeletal system of each animal. You can feed the animals and learn what they like to eat. And even build a skeletal puzzle discovering how the bones fit together. I won't tell you about everything, as it's so fun to explore the app and make new discoveries. Let's just say, my boys just loved the digestive system! Almost everything responds to a tap on the screen - go on be curious! I have to admit once the kids went to bed, I opened the app to explore more myself. It's lots of fun! It's not all educational, as kids learn by interacting with games in the app too. It's all cleverly interlinked so you don't think of it as games or teaching elements. There's a fun racing game where you can race two different animals and see who runs faster. Poor Sloth seems to lose every race! Each animal has additional activities and games, for example, you can feed a Joey and see how it grows in its mummy's pouch. Create a unique profile for each kid. I love the fact that you can create a unique profile for each child. This is particularly useful for families that share one device among different kids. For a long time, we've only had one iPad and the kids had to share their screen-time on the device. They liked apps which allowed them to play on their own profile which stored their individual progress. Tinybop lets you create a dashboard where you can change preferences, download handbooks and read interesting articles (there's a really interesting article about what questions people used to ask before we could say "Google it"!). I would strongly recommend downloading the Mammals Handbook. It turns the Mammals app into a fantastic resource for teachers or homeschooling families as it includes additional information about the animals and discussion questions. Tinybop develops their apps in over 40 languages. Parents can select the different languages they want to make available to their kids in the app using the dashboard. When the child uses the app, they can tap the settings button and select a language. This is a very useful feature for bilingual and multilingual families. It's a pity they don't offer Afrikaans (my native tongue). Most kids love animals and will be drawn to an app featuring them. 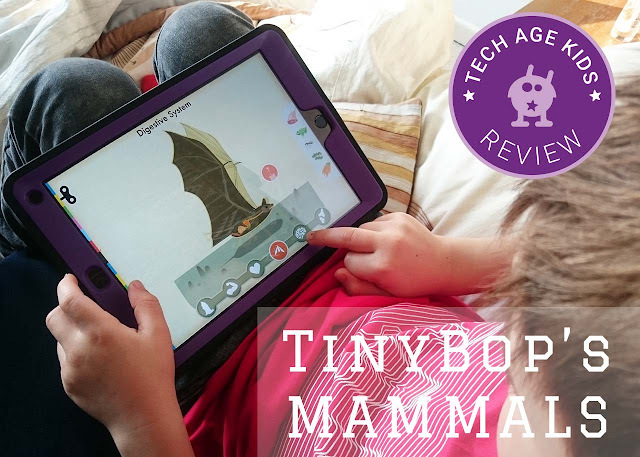 Tinybop acts on this assumption with the Mammals app, enabling kids to learn and explore the anatomy and habitats of 5 mammals. There's not a lot of animals included, but I do believe in this case, less is more. Each animal is well developed with lots of features and games and it oozes quirkiness. The idea is that it would create more discussion about other animals and places they live in the world. I love the fact that Mammals is a fun app to explore as parent and child, but just as cool for kids on their own. My boys loved using the goggles in the app to see how the different animals viewed the world. They also spent a long time comparing animals in races, and discovering what food each animal likes to eat. BUY: You can purchase the individual Mammals App ($2.99) or invest in the Explorer's Library ($17.99) which includes Mammals and 8 other apps about Space, Earth, Plants, Machines, The Human Body, Weather, Homes and Buildings.